In Nigeria, sono giorni tristissimi per i massacri di persone inermi e la distruzione d’intere villaggi da parte del Gruppo estremista islamico Boko haram. In allegato due sintetici articoli ripresi dalla rivista on line Internazionale sugli ultimi attacchi e su cos’e’ Boko haram. Ma dalla Nigeria, un paese nel quale le grandi imprese transnazionali non hanno mai dato una bella prova di se’ in fatto di responsabilita’ ambientale e sociale, arriva anche una buona notizia. Per la prima volta il colosso petrolifero Royal Dutch Shell ha accettato di pagare un risarcimento di oltre 70 milioni di Euro ai pescatori e contadini di Bodo, una comunita’ del delta del fiume Niger. La comunita’ di pescatori e contadini era stata gravemente danneggiata da due fuoriscite di petrolio avvenute in Nigeria nel 2008. Un disastro ambientale immenso. L’azienda riconoscera’ a ciascuno dei 15.600 pescatori e contadini di Bodo un risarcimento di 2.800 Euro (corrispondenti a circa 33 salari minimi mensili), mentre altri 27 milioni di Euro andranno a tutta la comunita’. L’accordo e’ stato raggiunto dopo una battaglia legale durata piu’ di tre anni. E’ la prima volta che per danni d’inquinamento ambientale in Nigeria causati dall’industria petrolifera viene pagato un risarcimento del danno. Una lezione anche per la civilissima Italia! Oil-giant Shell have agreed a compensation package of £55m to compensate 15,600 Nigerian fishermen and their community after it was devastated by two massive oil spills in the Niger Delta in 2008 and 2009. 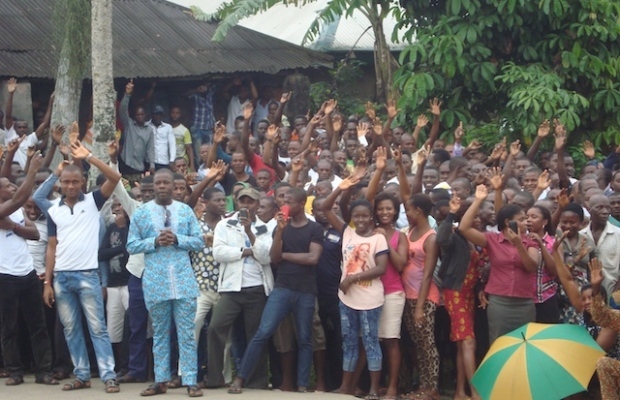 Today’s announcement follows a three-year legal battle by the Nigerians’ lawyers, London based law firm Leigh Day, in the High Court in London following the spills which devastated the environment surrounding the community of [ http://goo.gl/maps/YSZDK ]Bodo, in Gokana Local Government Area, Rivers State, Nigeria. Each member of the community impacted by the oil spill will each receive approximately 600,000 Nigerian Naira (£2,200) paid into their individual bank accounts over the next few weeks. The minimum wage in Nigeria is 18,000 Nigerian Naira a month and 70% of the population live below the poverty line. The total cost of the compensation package agreed with Shell is £55m being split £35m for the individuals and £20m for the community and is thought to be one of the largest payouts to an entire community following environmental damage. It is the first time that compensation has been paid following an oil spill in Nigeria to the thousands of individuals who have suffered loss. Experts have confirmed that the spills destroyed thousands of hectares of mangrove, which is the largest man made disaster of this sort ever seen. In the aftermath of the spills Shell originally offered £4,000 (four thousand pounds GBP) compensation to the entire Bodo community before the villagers sought legal representation from lawyers in London, where Shell have their headquarters. In a separate process, Shell has also pledged to clean up the Bodo Creek. These efforts have been led by Bert Ronhaar, the former Dutch Ambassador to Nigeria, who acted as mediator with the community and Shell to ensure that the creek is cleaned to international standards. It is planned that the clean up of the Creek will commence over the next two to three months. Bodo is a fishing town. It sits in the midst of 90 sq km of mangroves swamps and channels, which are the perfect breeding ground for fish and shellfish. It is a rural coastal settlement consisting of 31,000 people who live in 35 villages. The majority of its inhabitants are subsistence fishermen and farmers. Shell say they were informed of the first leak in early October 2008. The community says by this date oil had already been pumping into the creek for approximately six weeks. Even then it took Shell over a month to repair the weld defect in the pipeline. The second spill occurred in December 2008 and was also the result of equipment failure. It was not capped until February 2009 during which time even greater damage was inflicted upon the creek as crude oil pumped into the rivers and creeks per day over a period of two months. The Trans-Niger Pipeline has suffered an incidence of operational oil spills between 2006 and 2010 at a rate 133 times greater than the European average. In 2011 Shell admitted liability for the spills but continued to dispute the amount of oil spilled and the extent of the damage caused. Leigh Day began legal action at the High Court in March 2012 after talks broke down over compensation and a clean up package for the community. Today’s announcement that a settlement has been reached comes ahead of a full trial, which had been planned for early 2015. The lawyer representing the claimants, [ http://www.leighday.co.uk/Our-experts/partners-at-ld/Martyn-Day ]Martyn Day from Leigh Day, said: “We came to a provisional agreement with Shell just before Christmas. I immediately then travelled out with a team of 20 to meet with our clients to see if they were happy with the deal. We were able to see 15,400 of them (98%) in 8 days. “In the week before Christmas I personally met with around 800 clients and I don’t think I have ever seen a happier bunch of people. Every single one of the clients we met has said yes to the deal. “Whilst we are delighted for our clients, and pleased that Shell has done the decent thing I have to say that it is deeply disappointing that Shell took six years to take this case seriously and to recognise the true extent of the damage these spills caused to the environment and to the those who rely on it for their livelihood. “We hope that in future Shell will properly consider claims such as these from the outset and that this method of compensation, with each affected individual being compensated, will act as a template for Shell in future cases in Nigeria and in the other countries in which it operates.” Chief Sylvester Kogbara, Chairman of the Bodo Council of Chiefs and Elders, said: “For now, the Bodo community is very happy that this case has been finally laid to rest. The hope is that this will forge a good relationship with Shell for the future, not only with the Bodo people but with all the Niger Delta communities that have been impacted in the same way as us. “We also hope that Shell will take their host communities seriously now and use this platform as recommended by UNEP for the clean-up of the whole of Ogoniland. “We are thankful for the strength and perseverance of our international lawyers, Leigh Day, for their tenacity to end this case in the way that it has. We also appreciate our Nigerian lawyers for their cooperation with our international lawyers. We are thankful to all that have contributed in one way or another to the conclusion of this case such as the various NGOs, especially Amnesty International, who have come to our aid. And also NAGOND that has aided this process to come to a conclusion. We are also thankful to the media for highlighting the unprecedented damage to our environment. “Due to the cordiality of the conclusion of this agreement with Shell, we are hopeful that the clean-up of the Bodo environment will follow suit in no distant time.” The United Nations, Amnesty International and the Nigerian government have all expressed deep disappointment with Shell’s lack of action in the region. The Ogoni fishing and farming communities had accused Shell of applying different standards to clean-ups in Nigeria compared with the rest of the world. Amnesty described the oil spill investigations as ‘a fiasco’. Information was correct at time of publishing.